Posted on May 12, 2014 | 4823 views | Topic : Property News. PETALING JAYA: National infrastructure company Syarikat Prasarana Negara Bhd has completed the feasibility study on the third light rail transit line (LRT 3) covering 36km from Bandar Utama in Damansara to Klang, estimated at RM9bil. A source close to the matter revealed that Prasarana had submitted the study and recommendations to the Land Public Transport Commission (Spad) for the construction of the new LRT line recently. “The Government is likely to give the go-ahead for the project as this line will cover some important areas of Selangor. It comes to RM250mil per km – all inclusive except for land acquisition cost,” he told StarBiz recently. The feasibility study is now with Spad for review as well as approval. “If approved, work could begin as early as the first quarter of next year,” said a source who also pointed out that the LRT 3 would start in Bandar Utama instead of Kelana Jaya as was previously speculated. In Bandar Utama, the LRT will intersect the mass rapid transport system and go on to Centre Point before cutting across to Kelana Jaya. “The Bandar Utama MRT station will be a transportation hub in that part of Selangor,” said the source. Prasarana group managing director Datuk Seri Shahril Mokhtar was previously quoted as saying that Shah Alam was in dire need of the LRT service and it was acknowledged by the Government. He said the plan had been incorporated into the Klang Valley Public Transport Masterplan. Some of the companies seen to stand a good chance to bid for jobs in the proposed LRT 3 are Trans Resources Corp Sdn Bhd (TRC). UEM Builders Bhd, Intria Bina Sdn Bhd, Sunway Holdings Bhd and Malaysian Resources Corp Bhd (MRCB). These are some of the companies that have major contract packages in the ongoing RM7bil Kelana Jaya and Ampang Lines LRT extension projects. 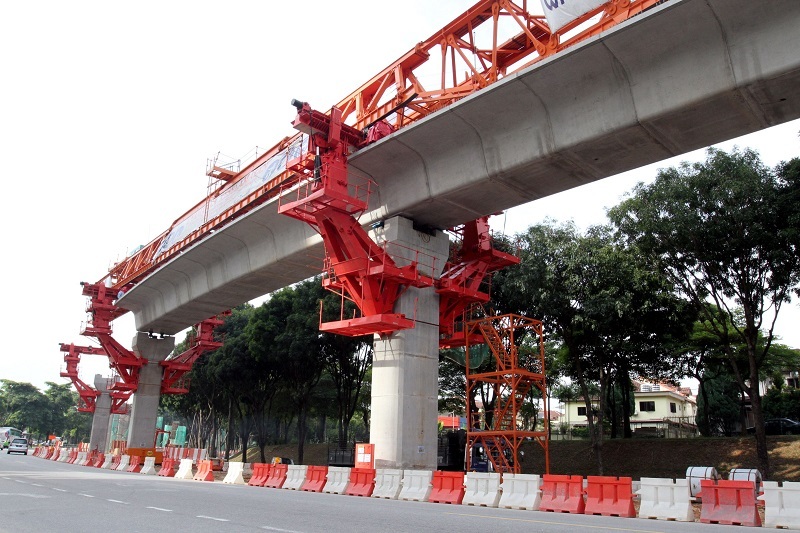 For the system work in the extension project, Prasarana has awarded a contract worth RM673.9mil to a joint venture (JV) led by UK company Colas-Uniway and Malaysia’s CMC Engineering Sdn Bhd (Colas-CMC). The extension of the current LRT lines are on schedule and are progressing at 56%. The Ampang line extension is set to begin from the Sri Petaling station, cutting through Kinrara and Puchong to end at Putra Heights, spanning 17.7km, with 13 new stations. The Kelana Jaya extension, which begins from the Kelana Jaya station to Subang Jaya and USJ, will end at Putra Heights spanning 17km. It will also have 13 new stations. All these developments are expected to improve Prasarana’s operating income, largely contributed by the LRT operations. However, the recent increase in electricity tariff would lower the margin. Power takes up about 30% of Prasarana’s overall operating costs. Shahril recently tweeted that Prasarana could build its own solar or wind-based power plant. Another matter affecting Prasarana’s operating income growth is the LRT tariff that has not been reviewed for 12 years despite escalating costs. Nevertheless, as far as the construction sector is concerned, the new LRT 3 project, if approved, will give another shot in the arm for the sector as it is still not factored in yet. Most research houses assigned an “overweight” call on the sector earlier this year, based on the strong support by the Government’s robust development programme to improve the land public transport system in Greater KL. Maybank IB pointed out in a recent construction sector report that a slew of positive events which occurred since the beginning of 2014 had strengthened the construction work sector in the near as well as longer term. “The positive newsflow includes major construction job awards such as the Project 3B (new coal-fired power plant in Jimah, Negri Sembilan) and the Langat 2 water treatment plant, the go-ahead for the Refinery and Petrochemicals Integrated Development and the Klang Valley Mass Rapid Transit Line 2. According to the Statistics Department, the total value of construction work done in the first quarter of this year was RM25bil which showed 21.2% growth year-on-year. Selangor continued to record the highest value of construction work done at RM5.97bil or 23.9% in the country, followed by the Federal Terrritory of Kuala Lumpur at RM4bil or 16% and Johor at RM3.99bil also 16% among other states.